It was one of the most memorable nights in Baltimore sports history. UMBC men’s basketball’s history-making victory in the NCAA Tournament. And the team that pulled it off is once again in the spotlight. The Retrievers are up for an ESPY Award. ESPY stands for Excellence in Sports Performance Yearly. It’s ESPN’s way of recognizing the best in athletics from the past year. The Awards show goes down Wednesday night and UMBC could be taking home some hardware. Their 74-54 win over Virginia in the 2018 NCAA Tournament is up for the 'Best Moment' ESPY. It was the first time in NCAA Tourney history a No. 16 seed topped a No. 1 seed. "It's going to be a cool experience. Everyone dreams of being out on the red carpet at some point in their life," said UMBC forward/center Nolan Gerrity. 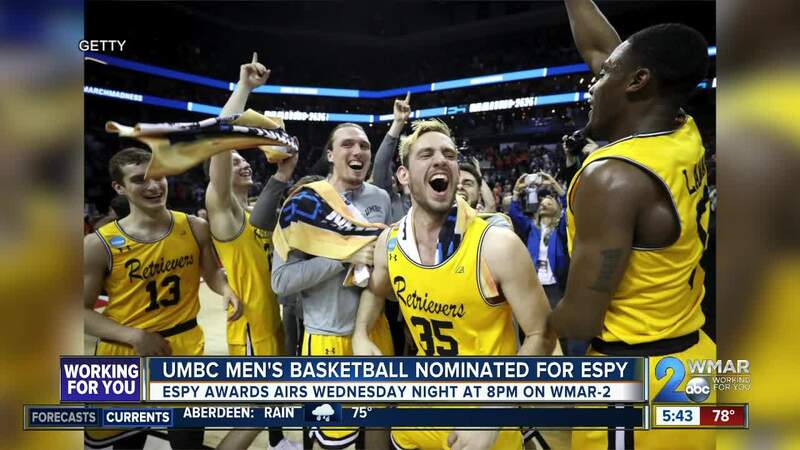 A handful of members from that team, along with Coach Ryan Odom, will be representing UMBC at the ESPY’s. They departed BWI for Los Angeles, site of the awards show, Tuesday afternoon. They are one of four 'Best Moment' nominees. They want to win it. "That would be a crazy accomplishment for not only me, myself, but the team, the program and the University," said former UMBC guard Jourdan Grant. "It would be big time for everybody. It would be another crazy thing that's happened this year for us. I think that would really top it off." "I'm not ashamed to say I watch the highlights all the time. Probably my most watched YouTube video ever," said UMBC forward Joe Sherburne. So what do they think about their chances at winning? "I think we got it in the bag because there are a lot of great moments up for it but this is the first time that an event like ours has ever occurred," said Gerrity. "I'm thinking we're going to win an ESPY," added Sherburne. "Nolan and I are going to be preparing our speeches mid-flight if we get a chance to say anything. Who knows what we'll say? I'm hoping we win." The other nominees for 'Best Moment' are the Minnesota Vikings' miraculous last second touchdown catch by former Maryland Terrapin Stefon Digs to advance to the NFC Championship game, Notre Dame winning the NCAA Women’s Basketball Tournament and the expansion Las Vegas Golden Knights topping the Winnipeg Jets to advance to the Stanley Cup Final. Fans vote on who they want to win. You can vote for UMBC by clicking here. Voting is open until the ESPY Awards begin on Wednesday night. The show airs live on WMAR-2. It starts at 8-P-M.